The Kansas Historic Resources Inventory (KHRI) is an interactive online database that contains all of the SHPO's survey records. KHRI is fully searchable and available to the public. Users interested in submitting new surveys or updating existing survey forms can register. Once approved, they can log in and go to the "Tutorial" tab for additional instructions on searching and becoming a registered user. This free public database contains information on historic buildings, structures, landscapes, objects, and districts found in the state. Survey reports synthesize the information gathered during a reconnaissance or intensive-level survey. Included within the report are the methodology, survey findings, historic context information, and recommendations for further action. See recent examples. Surveying is the process of identifying and gathering data on historic resources. It includes recording basic physical and historical information about a property, photographing it, and drawing a site plan. In other words, survey is a means of documenting historic resources and does not automatically result in the listing of a property in the National Register of Historic Places or Register of Historic Kansas Places. There are basically two types of survey, as outlined by the National Park Service Bulletin 24 "Guidelines for Local Surveys: A Basis for Preservation Planning:" Reconnaissance and Intensive (see below for side-by-side reference chart). Reconnaissance survey or "windshield survey" is used to gather a general idea about the distribution and presence of historic resources and often forms the basis for an intensive-level survey. For instance, a community might do a quick windshield survey to identify a neighborhood with a high concentration of historic homes. Using this basic information, a more focused survey can occur to understand the significance and historic integrity of the neighborhood. This section about survey pertains to above-ground resources. For more information regarding survey of below ground resources please visit our SHPO's Guide to Archeological Survey. What types of historic resources can be surveyed? The types of historic resources in the built environment that can be surveyed include buildings, sites, structures, and objects. Buildings can include, but are not limited to, houses, barns, theaters, gas stations, warehouses, and factories. Sites can include designed landscapes (parks and gardens) and locations of important events (cemeteries and battlefields). Structures include windmills, water towers, bridges, dams, etc. Objects might include statues, sculptures, monuments, fountains, brick sidewalks, or brick streets. Surveys of individual properties conducted on an informal basis by the general public are a great way to document and learn about historic resources in Kansas. Surveys can also generate local interest and awareness while increasing marketing and tourism. What are the benefits of surveying? Formal survey projects—generally carried out by preservation consultants—provide a valuable service to a community. Information discovered during the survey process often provides additional insight into the community’s history and patterns of development. Results and recommendations from the survey can be incorporated into the city’s historic preservation plan, or, if no plan exists, information from the survey can provide the basis for implementation of a preservation plan. Incorporation of the information into the community’s overall planning process and/or disaster preparedness plans also has real value. Ultimately, the preservation of these historic resources can mean savings in energy, time, money, and raw materials. A survey of local historic resources also serves as an important first step in determining the potential for an area to be listed as a historic district in the National Register of Historic Places or the Register of Historic Kansas Places. The information gathered from a survey allows the SHPO staff to evaluate the potential for a historic district, including determining appropriate boundaries, which should encompass the highest concentration of historic resources. The process of preparing a nomination for a historic district is intensive and often requires a professional consultant. Click here for more information on historic districts. With KSHS’s new interactive online database, anyone can survey a historic property and upload the information and photographs to KHRI. When conducting a formal survey of a commercial downtown or residential neighborhood, local communities generally hire professional preservation consultants who submit survey information to KHRI and produce a survey report. Funding for the hiring of consultants to conduct local surveys is available through the Historic Preservation Fund grant program. Trained volunteers can also carry out these types of surveys. Find examples of recent survey reports. How do I access survey information or find out if a property has been surveyed? 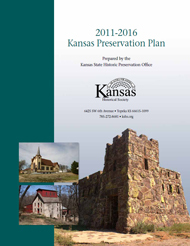 Search our new online database, the Kansas Historic Resources Inventory (KHRI). Click on the “Tutorial” tab at the top of the page for instructions and tips on searching. For information on archeological site survey and how to record an archeological site online.